What is the second most common religion in the US? 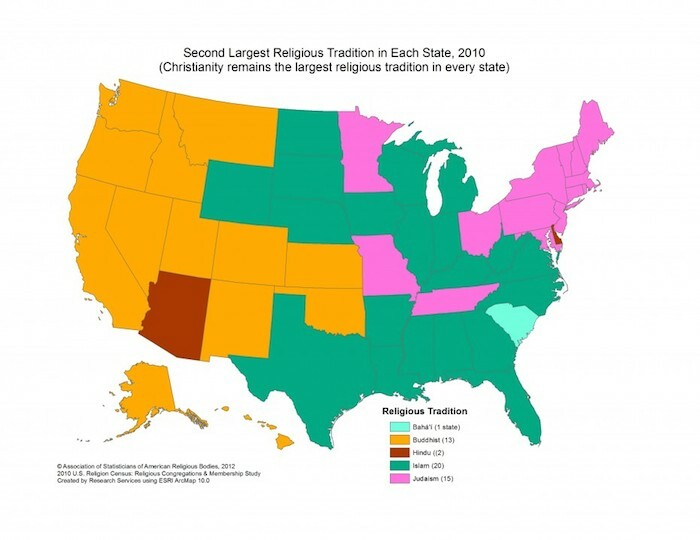 It is a given that Christianity is the most common religion across the US. But the Washington Post has a nice set of graphics that provide a state-by-state breakdown (and even down to the county level) of the second most popular religions, and there were some surprises. I find it interesting that Buddhism is the second most common religion in so many Western states while Islam wins out in the deep South, that hotbed of Christian fundamentalism. The biggest surprise is that the Baha’is are the runners-up in South Carolina. Who would have guessed that? I suspect that most Americans don’t even know that such a religion exists at all. The other surprise is that Hindus come in second in Arizona and Delaware. Since most Hindus are of Indian origin, I would have thought that they would be concentrated in major urban areas. It looks like nonbelievers were not included as a category in this compilation that was put together by the Association of Statisticians of American Religious Bodies. I agree with Reginald the Jehovas Witnesses, 7th Day Adventists, Baptists, Catholics, Mormons, Methodists, Episcopalians and more are all “Christianity” and yet many of those sects don’t recognize the others as “Christians”. Yeah, I also agree with the prior commentators. When I was in High School, I worked as a corps-boy at the local summer campsite, which was owned by the Methodist Church. It was available for use by any Christian denomination and we had the gamut of traditional Protestant churches use it, from Lutherans to Baptists, but no Catholics and no Mormons ever came. No J-Ws, either. They are all in the Christian tradition, with full continuity, and will tell you so themselves. If someone else is going to play the No True Christian card, that’s their problem. Christ is central to their religions, and mutual recognition is not required. That’s like arguing about which religious Jews are actually Jews (historical or modern). Kind of weird for secular atheists to pick an arbitrary “side” and delimit Christianity (in one particular country) based on it. Neat to see the Bahai’s get a US state whichever one that is. (Is it one of the Carolinas? MyUS geography isn’t that good.) Would not have predicted that. Some of my relatives are Bahais, incidentally -- and are also some of the nicest and best people you could hope to know. I don’t notice Mano or the other commentators saying the other groups aren’t ‘real’ christians. They are commenting on how the groups themselves see other groups. They think it is amusing, they aren’t criticizing the inclusion or exclusion of various groups only noting it.